me and him: my tires are studs. p.s. driggs is beautiful. but the roads are a tiny bit frightening. i've only white knuckled it once so far, so i'm doing real good. 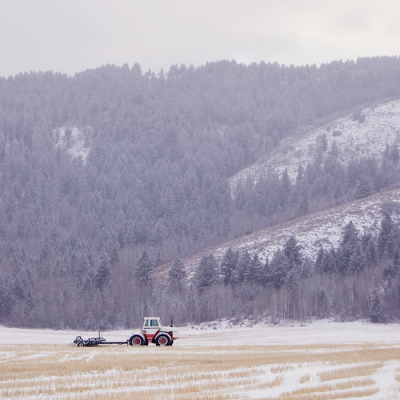 Pretty picture, but I think Farmer Jones need to get that equipment in the shed and out of the snow. Continued good luck with the drives. Kind of a nasty drive in the winter, but I don't know a prettier drive in the spring/summer. I like that picture, but it kind of makes me shiver. Oh, I hate driving in the snow. This time of year I want to move to CA. So what are you driving to Driggs for? Do you wave at the Egbert home place as you pass? You have the cutest blog ever. Your pictures are amazing by the way. You will have to take some pictures for me some time! And I have to agree about the laser tag thing!!! We need to go again! Be thankful you decided to get studs, you're gonna need them! BTW, I noticed yesterday that the tractor is still sitting in the same spot as in your photo, I think it might be parked there for the winter. Good luck with finals! i found your blog through my long time friend... ade. love your photography! i just got a new camera and i'm trying to learn the ropes of it all. you do beautiful work! i believe that tractor & field is on my family farm. :) i grew up my whole life where ade lives. just down the road of course. i LOVE driggs! as sucky as the winter is there... the summer & fall make up for it!